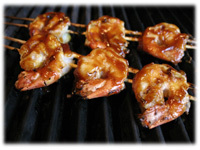 Do you prefer the Traditional sweet & sticky honey garlic sauce recipe for your grilled shrimp kabobs? 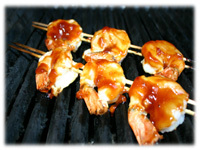 Or are you more adventurous and choose the new BBQ honey garlic sauce instead? Go ahead and slather on the honey garlic sauce of your choice as soon as the shrimp hit the grill - they cook so quickly the sauce doesn't have time to burn. And I mentioned versatile, this grilled garlic shrimp recipe make the perfect side dish to nearly every bbq recipe on this website. For best results, let these marinate at least an hour before grilling. Peel the shrimp and rinse them under cold water. Pat dry and insert 1 skewer through 3 jumbo shrimp. Some people like to use 2 parallel skewers to prevent them from spinning when flipping them on the grill, your call. 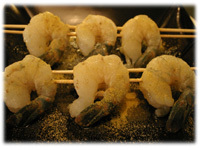 Rub the oil on the shrimp and shake 1/2 tablespoon garlic powder and lemon pepper on both sides of each skewer. Cover and refrigerate at least 1 hour for best results. Oil the BBQ grates well and pre-heat the grill to 575F - 600F. 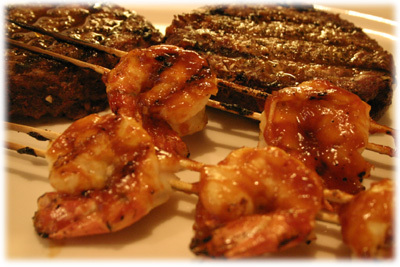 Place the garlic shrimp skewers on the grill, brush liberally with the BBQ honey garlic sauce or the traditional honey garlic sauce and close the lid. After 3 - 4 minutes lift the lid and wiggle the skewers to loosen them from the grates. Lift one of the skewers to check the garlic shrimp is turning pink and has nice grill marks. If so, then go ahead and flip all the skewers. Once the skewers are flipped brush more honey garlic sauce on the grilled shrimp. Close the lid and cook for another 3 minutes. 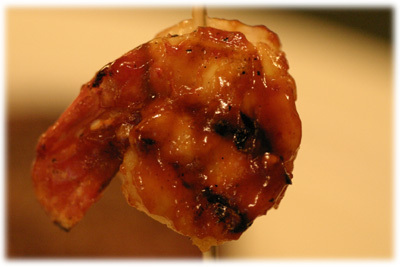 Lift the lid and if the bbq garlic shrimp are firm, pinky-orange with nice grill marks then remove them from the grill.